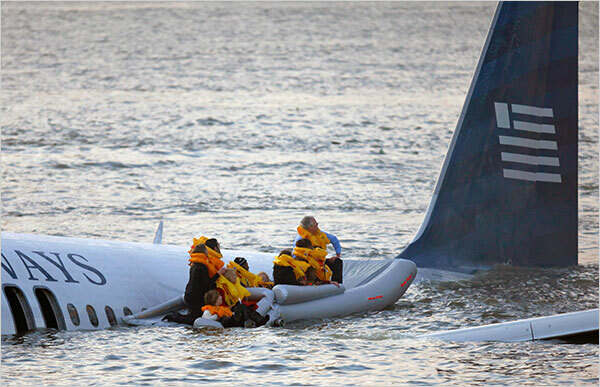 On January 15th, 2009 the world watched in horror as US Airways Flight 1549 ditched into the Hudson River, New York – after a bird strike caused the loss of both engines. Regularly referred to as ‘The Miracle on the Hudson’, the ditching was text-book. The aircraft stayed intact as it impacted the water and all 155 people onboard survived. Much of this was down to the incredible flying skills of Captain Chesley B. Sullenberger. Paraded on talk shows around the world, interviewed in magazines and offered numerous book deals, ‘Sully’ was a hero. But many forgot about the three cabin crew, who ensured that all of the 150 passengers onboard were evacuated safely, despite suffering their own injuries. Here we look at their incredible story. Cactus 1549 – Miracle on the Hudson. 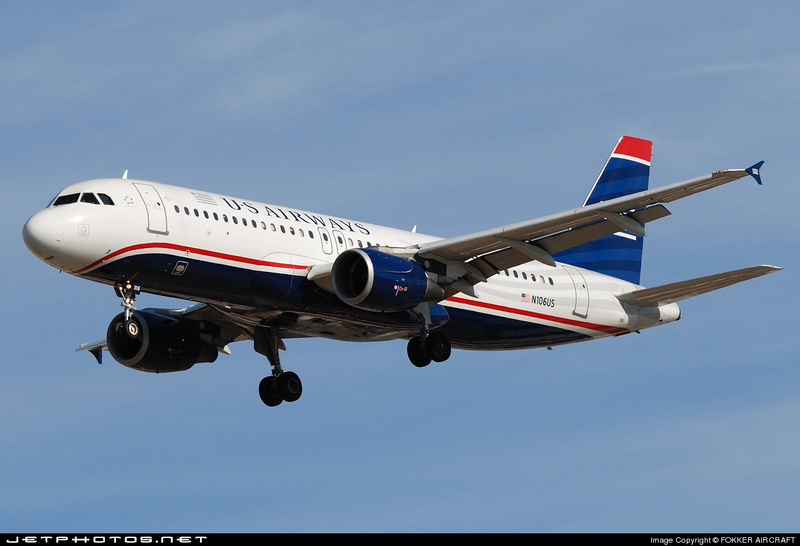 It had been a crisp and clear January day in New York, perfect flying conditions, as passengers boarded the Airbus A320 (N106US) for the short flight to Charlotte, North Carolina. Greeted by lead flight attendant Donna Dent and her colleagues Sheila Dail and Doreen Welsh, the three crew were US Airways veterans, with a combined flying experience of more than 95 years. 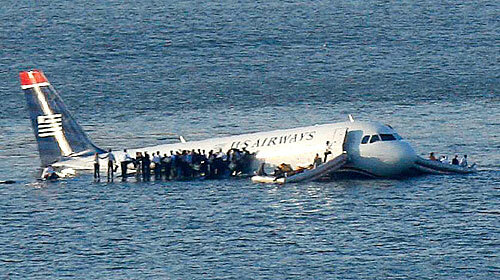 At 3.25PM the aircraft took off from Runway 04, at La Guardia airport. As they climbed away, the crew sat carrying out their 30 second review while passengers settled down for the flight. For the first few seconds all seemed normal. Then suddenly a fleeting shadow passed the windows, followed by a loud thump. First Officer Jeff Skiles had already spotted the flock of Canadian Geese as they flew towards the A320, but there was no way to avoid them. The windscreen turned a dark brown, as the birds struck the jet and warning alarms began to ring around the flight deck. On the forward Jump-seat Dent and Dail heard the thud and at first thought that the cargo door had opened in flight. However, as the engines choked on the birds and began to fail, an eerie silence fell over the aircraft and the smell of burning filled the cabin. “I think it was a bird strike” Dent whispered to her colleague. At this point they believed it was just a few small birds and they would be returning to the airport; more of an inconvenience than a full-scale emergency. Unable to communicate with Doreen Welsh at the rear, as the inter-phones were no longer working and with no word from the pilots, they were completely in the dark. Towards the back of the plane, some of the passengers were panicking. Welsh released herself from her crew seat and moved forward, in an attempt to reassure them. “I talked to the last five rows and tried to calm them down, saying that we will probably just go back to the airport and we’ll be fine. I had a fearful flyer in the back. She told me during boarding that she was petrified to fly. So I went up to make sure she was ok and everything looked ok at the time”, she later said during a radio interview with Fox News. But everything was not OK. Sullenberger and Skiles were battling with the power of gravity, as the jet lost all thrust and began to descend. As they attempted to restart the engines, frantic communications went on between the pilots and ATC in an attempt to find a suitable airport for them to land. However, for Sully it was now clear they would not make it back to any runway. It was then the chilling words, now famous around the world, were spoken, “We’re gonna be in the Hudson”. There was nowhere else for the aircraft to go. Moments before impact, the A320 is caught on camera. As Welsh made her way back to her crew seat and strapped herself in, she heard the words every cabin crew member hopes they will never hear, “BRACE FOR IMPACT!”. Immediately the crew training kicked in and the three began to shout at the passengers, telling them to adopt the brace position. Then the A320 hit the river. Welsh described the impact at the rear as ‘violent and horrible’; very different to the hard, but ‘not so bad’ description by her colleagues at the front. The water rapidly slowed the aircraft down and at first, Dail and Dent believed they had landed on the runway without the landing gear. Captain Sully came over the PA system once again, this time to initiate the evacuation. Getting up from her seat, Welsh moved towards the rear doors to assess the situation. It was only then, as she looked out of the windows, that she realised they were on water. Hesitating for a few seconds as the fact they had ditched slowly dawned on her, a passenger pushed past and started grabbing at the door, cracking it open. The freezing water of the Hudson began pouring in. Welsh tried desperately to close the door again, but it was too late. She turned to the passengers, many of whom were in shock and began yelling at them to move towards the over wing exits. Desperately they began to climb over seats to escape the rising water. The situation was slightly calmer towards the front. As with Welsh, both Sheila Dail and Donna Dent were unaware the plane had ditched and it was only when they looked out of their windows and saw the water, they realised the full extent of what had happened. Shouting evacuation commands, they opened their doors and began to get passengers off the sinking aircraft. At 1L, the slide failed to inflate properly. After pulling the manual inflation handle, it finally inflated – but not before a passenger had pushed past and jumped into the icy water. Door 1R slide inflated immediately, but the door itself failed to lock in place correctly. Thinking quickly, the crew member assigned an Able bodied passenger (ABP) to hold it open, in an attempt to stop it from puncturing the slide, as the rest of the passengers evacuated under his arm. In fact, things were so calm at the front of the aircraft, a stunned Dent later revealed, that one passenger actually managed to take off his clothes, thinking he would have to swim to shore. Passengers, some in their life jackets, others carrying seat cushions which can be used as flotation aids, made their way onto the wings and the emergency slides, now doubling as rafts. Some were bottle necking in the middle of the cabin, so Dail and Dent called them to evacuate using the forward doors. The rear of the plane was rapidly sinking, and Welsh later spoke of how she feared for her life as the water rose to neck height. Finally, she managed to get to her colleagues at the front of the aircraft and it was only then she discovered she was badly injured. Blood was pouring from a large gash in her leg, probably caused on impact as a massive piece of metal came up through the cabin floor and struck her leg. 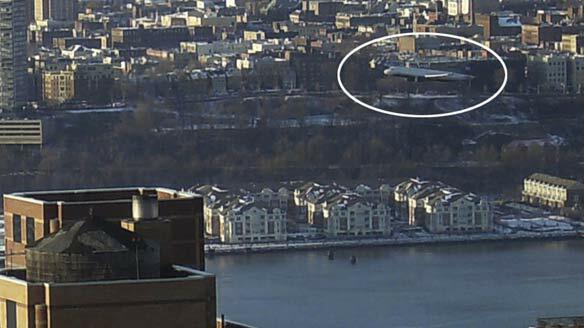 Ferries that cross the Hudson were the first on the scene to rescue the stranded passengers. Finally, all the passengers were off the aircraft. Captain Sully was the last to leave, after he and First Officer Skiles carried out two sweeps of the cabin to make sure everyone had evacuated. But, their ordeal was not over. The crew and passengers were sat in icy water, with an outside air temperature at the time of -7ºc. The survivors now faced the very real threat of hypothermia. Thankfully, rescue was quick to arrive, as the ferries that zig-zag the river raced over to the crash scene and began to pluck the freezing passengers to safety. Rescue workers and emergency services soon arrived and approximately 25 minutes after the impact, all passengers and crew had been rescued. The whole ordeal, from take-off to the last passenger being pulled from the wreckage, had taken a little over 30 minutes. 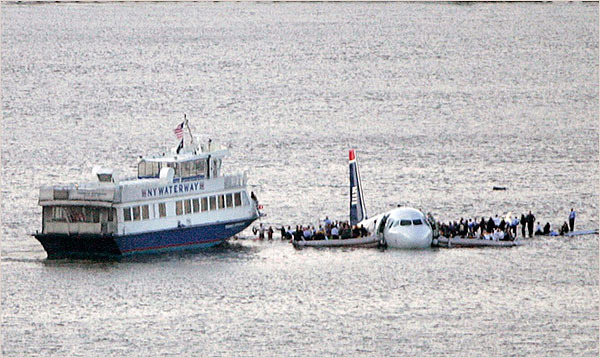 The last few passengers await rescue, as the aircraft slips below the water. Miraculously, there were only five serious injuries amongst the 155 souls on-board, including the deep laceration to Doreen Welsh’s leg which required months of physical therapy and left a permanent scar. 78 others were treated for minor injuries and Hypothermia, but everyone was alive. 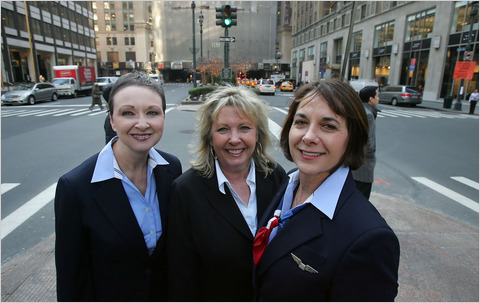 After the event, both the flight crew and cabin crew were given numerous awards for their bravery, including the keys to the city of New York by Mayor Bloomberg. But it was the expert flying skills of Captain Sullenberger that was praised so highly and continually discussed amongst the worlds media. However, there were three other heroines on-board Flight 1549 without which, the outcome may have been very different. They used initiative and the skills they had picked up through many years flying, to use ABPs correctly when there was a problem with door 1R. They ensured slides were inflated correctly, got passengers to put on their life-jackets and remove seat cushions to use as flotation aids. Moved passengers towards the centre of the cabin, when the rear exits were submerged under water and then to the front when the over-wings became blocked. They remained calm and reassured passengers, whilst waiting to be rescued in freezing water. But most of all, they showed true professionalism throughout the whole ordeal, whilst dealing with their own shock, fears and injuries. Welsh said it’s sometimes hard to believe that a full decade has passed since the event that, for better or worse, has come to define her life. She will spend the 10th anniversary of the Miracle on the Hudson at the Carolinas Aviation Museum in Charlotte, where what is left of the plane is on display. At 3:31 p.m., the exact moment that the plane made its unpowered ditch into the river, there will be a champagne toast. All of the crew members will be there, including Sullenberger. Sheila Dail, Donna Dent and Doreen Welsh proved the very reason why cabin crew are onboard any aircraft, something many of our passengers unfortunately seem to forget. That is why they join our list of Angels Of The Sky. Angels Of The Sky. From left to right – Donna Dent, Doreen Welsh and Sheila Dail. Check out this incredible, real-time simulation of Flight 1549, from take off at La Guardia to impact on the Hudson River, including ATC and CVR recordings. I even if it’s just know how I stopped up right here, yet I thought that publish had been good. I not understand who you might be nonetheless certainly you’re gonna a widely known blogger when you find yourself certainly not already Cheers! assert it. You’re making it enjoyable and you ontinue to ake care of to stay it smart. I can’t wait to learn far mode from you. I’m gome to convey my litle brother, that he should also go to seee this web site on regular basis to take updated from latest news update.